At this small boutique dairy, animal welfare and producing real food with compassion is high on the priority list. Owner Fiona Provan has worked hard to realise her vision for compassionate, sustainable dairy farming. She is an inspiring example of how individuals with passion can create a successful small scale business that give alternatives to the profit driven approach of big business. Ethical, raw, Jersey milk from 'purely pasture' fed cows allowed to keep their own calves, delivered via mail order around the UK to the compassionate consumer. We are one of only two dairies in the country using the 'calf at foot dairying' method." The dairy got its name because after giving birth, all the calves are kept with its mother, which is unusual in the dairy industry. Keeping the calf with its mother is important to Fiona because it reduces the mother's stress levels and it shows her compassion for mother and calf. Keeping the calves at foot (by mums side) until a natural weaning age, means that each cow nurses her own calf for at least 9 months and the mothers are milked just once a day for the dairy. The cows are all allowed to run together as one natural herd of all ages. Each cow is milked unrestrained and time and attention is given to her specific needs. Cows retire on the farm after their reproductive life is over and are allowed a natural, gentle departure whenever possible. The micro dairy has a zero grain policy and are certified producers of the Pasture Fed Livestock Association. The Jersey herd is a 100% grass-fed for life and considering all these things it is easy to understand the huge demand for this dairy's milk. The raw milk straight from the farm is sold either at the farm gate or via the internet, delivered by national courier delivery service within 24 hours. The milk is packed in a thermal eco box and it will generally remain fresh for 7 days after couriering before souring. So long it is kept in a very cold fridge at about 2'C undisturbed with the seal intact. Video: The Calf at Foot microdairy in Suffolk was given notice by their landlord in 2014. A crowdfund campaign helped Fiona and her cows with the costs of moving and getting established. The Calf at Foot dairy's website explains that pasteurisation is completely unnecessary if the cows are clean, healthy, allowed to pasture and hygiene standards are followed. In the large scale, industrialised milk industry cows are grain-fed which puts them at an immediate e-coli risk. These cows are pushed for production, are overworked and suffer physical and nervous trauma. They often do not last more that 3 lactations or live past 5 years of age. All this milk is then co-mingled, which makes pasteurisation absolutely essential to keep everyone safe. Read more here. Video: A video thanking the generosity of the crowdfunding sponsors who enabled the move to Home Farm Somerleyton and for expanding the dairy. Two years ago the dairy came at a crossroad when the herd was given notice to leave their home in Hollesley Bay. With the financial strain of unexpected moving costs, Fiona turned to crowdfunding at Crowdfunder and in the process found new opportunities to expand the herd to meet the huge demand. £1,500 would also pay for a much needed new milking machine. The Calf at Foot dairy successfully raised the target of £5,000 and more and moved to their new home at Farm Somerleyton. In the video Fiona thanks all the sponsors and is grateful for a new, forward-thinking landlord. A huge thank you to the Sustainable Food Trust for this story and video about Fiona's system! Read the article here. Video: There are many reasons why people are concerned about industrial dairy, including the distress the cows experience, the spread of disease among cows kept in close quarters, imported feeds, environmental pollution, male calves shot at birth and, in general, an approach which is profit driven at the expense of animal welfare and health. A Sustainable Food Trust video. Listen to an interview with Fiona here. 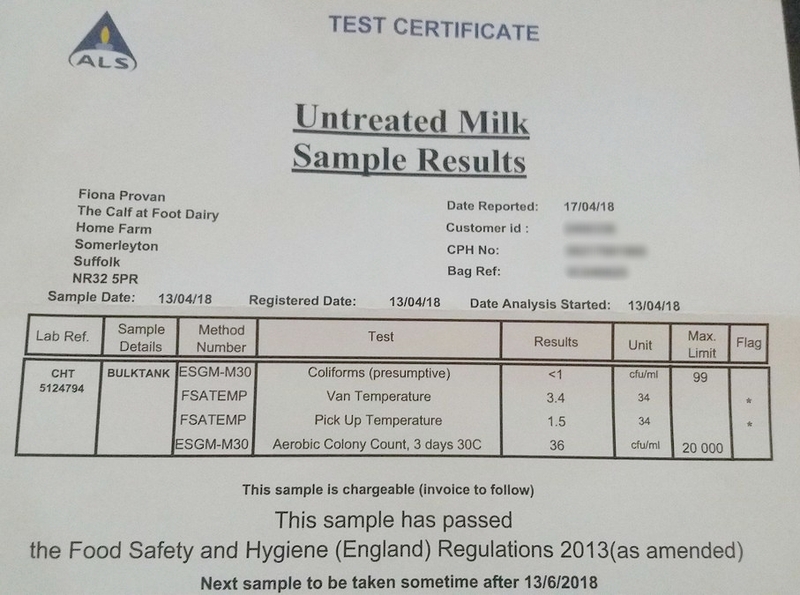 Image: micro dairies can achieve amazing test results for their milk because they can take the required care, click to enlarge. See the Coliforms and ACC results - amazing! See more beautiful pictures from the farm's website gallery here. Raw milk revolution: it's tastier - but is unpasteurised dairy safe? Video: Ethical farming | Alternatives | Is a vegan society a better society? Posted on August 27, 2016 by ARMM Admin and filed under Raw Milk, farm examples, Vegan Resources and tagged raw milk the calf at foot dairy ethical milk calf at foot dairying raw milk dairy examples.